Sky Atlantic has teamed up with snow artist Simon Beck to create a temporary mural celebrating the upcoming new series of Game of Thrones. In homage to the series' tagline 'Winter is coming', Beck was enlisted to create a giant snow tribute to Game of Thrones in the French Alps. The artist used his footsteps to create prints in the fresh snow. He walked 32.5km over 13 hours to mark out the House of Stark’s insignia - a tribute to Jon Snow who [spoiler alert] was murdered at the end of the last series. Beck also marked out 'Winter is coming' in the franchise’s script. 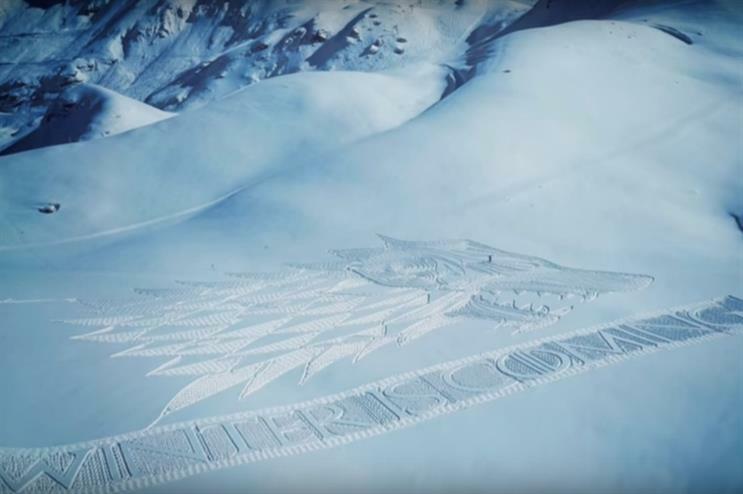 Zai Bennett, director of Sky Atlantic, said: "Set in the alpine snow, having taken over 13 hours and covering 32.5 kilometres, Simon Beck’s amazing Stark sigil from Game of Thrones is the perfect tribute to a truly epic TV show." The first episode of Game of Thrones season six will be simulcast on Sky Atlantic at 2am on 25 April - the same time that it airs in the US. The series has produced a number of memorable activations in recent years, including a dedicated interactive exhibition, a pop-up restaurant, a touring ice throne and a dragon installation at Belfast Zoo.